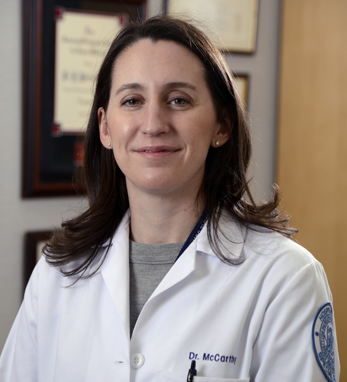 Dr. Moira McCarthy is a board-certified (ABOS) orthopedic surgeon who specializes in sports surgery, performing arthroscopic as well as open knee and shoulder procedures for active individuals. Moira is adamant about the importance of offering customized care to patients, including non-surgical treatment alternatives for those with knee and shoulder injuries. Hailing from Troy, New York, Moira is a third-generation Irish American with ties on both sides of her family (the McCarthys and the Sullivans) to County Cork. She received her undergraduate training at Princeton University, and completed her medical qualifications at Columbia University College of Physicians and Surgeons. She completed her resident training at the Hospital for Special Surgery. After her fellowship, she spent time in France and Australia, learning alongside leading sports surgeons how to better repair damage to the knees and shoulders of injured athletes. She works closely with the Brooklyn Nets, Long Island Nets, New York Liberty, and, previously, the New York Giants, as well as many high school and collegiate teams and individual athletes.